Pharmacists are keeping patients healthy each and every day, whether it is through the safe dispensing of medicines, giving minor ailment advice or services such as weight loss and weight management. As a pharmacist with over 15 years experience in the field of weight loss and weight management I have accumulated not only lots of weight loss successes for my patients but also a wealth of dieting knowledge. True weight loss, with fat being primarily lost rather than just water, is not without consequences for many people. Yes these are largely positive, eg improved mobility and body confidence, but these positive diet outcomes can be also manifested as decreased blood pressure, type 2 diabetes remission for example. The management of these co-existing diseases or medical conditions must be suitably managed by a healthcare professional. It is critical to keep patients healthy which is where pharmacists are ideally placed. It was therefore a great pleasure to be asked to write an article for the Pharmacy Business Magazine which is circulated to community pharmacies across the whole of the United Kingdom. The article brief was to write a one-page piece on "keeping patients healthy" through weight loss and weight management. 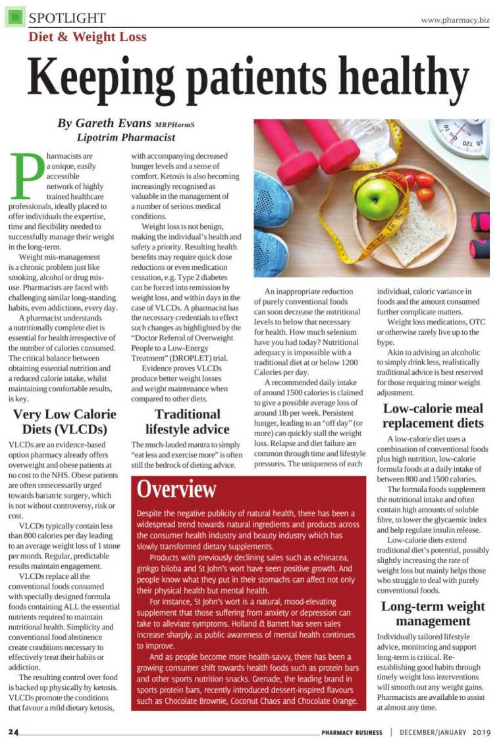 My article, from a working pharmacist's viewpoint, detailed the various options available to pharmacists and other healthcare professionals when faced with patients wanting to lose excess weight. Why is pharmacy the ideal place to get weight loss advice and support? Why are pharmacists one of the most capable healthcare professional to offer true weight loss support and diet advice? Why are Very Low Calorie Diets (VLCDs) such as Lipotrim a perfect solution to most people's dieting needs? What is the role of traditional diet advice "to eat less and exercise more"? How do low calorie meal replacements fit within a comprehensive weight management offering? How do you achieve long term weight maintenance?